The show opens with the Donnelly parents leaving for a two-week getaway. They lecture Chett about all he's supposed to do -- and not do -- while they're away, including looking after Wyatt. But he's distracted. We watch as his mind drifts to monster trucks, Baywatch babes and beer. So, with the folks away, Wyatt is ready to play. Two weeks without a curfew! But they can't get into the cool nightclubs, so Lisa turns them into vampires. They start staying out all night and then sleeping through class and flunking their tests. Wyatt's sudden decline gets the attention of Principal Scampi, and he calls the Donnelly house to talk to his parents. So Chett goes down to the school to have a showdown with Scampi. But Scampi tells him that he’s heard Wyatt and Gary have been hanging out at Club Lust. They decide they both have to go and check it out. When they get there, the bouncer won’t let them in until Scampi recognizes him as a former student and threatens to out him to the crowd as a geek who took a “woofer” to the junior prom. The bouncer lets them in and the two of them proceed to totally humiliate themselves on the dance floor. They jerk and twitch and point. Chett learns that Wyatt, Gary and Lisa are in a VIP section of the club known as The Tombs. He leads the way -- still "dancing" -- telling Scampi to continue looking inconspicuous. Meanwhile the guys and Lisa have been cornered by real vampires and are in serious trouble. Chett and Scampi manage to get Gary and Wyatt into the elevator and hatch a plan to fight the vampires. They need garlic. Gary happens to have an Italian hoagie he brought along for a late-night snack. For wooden spikes, Scampi produces some sharpened No. 2 pencils. Chett has a slingshot, which Scampi always warned would put out somebody's eye. And... in fact he is vindicated as Chett accidentally saves the day. He uses the slingshot to shoot a pencil at the vampire lord. He misses the vampire but hits a window, letting in sunlight, which ultimately destroys the vampire lord. In the next scene, Chett and Scampi appear all dressed up in gothic vampire hunting gear, having vanquished the rest of the vampires. 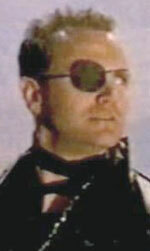 Chett sports a rakish patch over one eye.